Prepared with brown butter and subtle spices, this zucchini carrot cake with walnuts and topped with a generous cream cheese frosting is beyond amazing. I just finished another slice of this brown butter zucchini carrot cake and I’m back at my desk ready to write about it. Or should I go back to the kitchen and grab another slice? Maybe it would help me describe it even better? Ok, ok, this is such a poor excuse to eat more of it, I confess. Guys, this cake with a cup of tea is everything you need in life! Or almost. Every year in spring, I like to bake a carrot cake. There is of course my not-so-modestly called Best Ever Carrot Cake (seriously, it is so rich, moist, and flavorful; it’s to die for!) but also my Skinny Carrot Cake Muffins which feature a lovely vegan coconut milk frosting on top. And this year I was hungry for more. I browsed several recipes and found myself in love with carrot cake loaves. The reason is simple: a carrot cake loaf is somehow a quicker version and it doesn’t require so much effort. Yes, sometimes I can be lazy in the kitchen too – don’t blame yourself if you feel that way sometimes, it happens even to the most passionate foodies! Coming back to this carrot cake loaf idea, I stumbled upon a few recipes that really caught my attention. First there was the gluten-free carrot cake from Söta Salt, that I found absolutely gorgeous! Actually I wanted to prepare it for dessert when I went for dinner at my friends’ who are gluten-free but ran out of time. I still keep it in mind for later. The second recipe I loved was the brown butter carrot cake from Joy The Baker. Having these 2 recipes in mind, I went my own way after I tried a scrumptious zucchini carrot cake muffin in Chicago. It helped me decide what I really wanted in my recipe. There will be carrots, and there will be zucchinis as well. 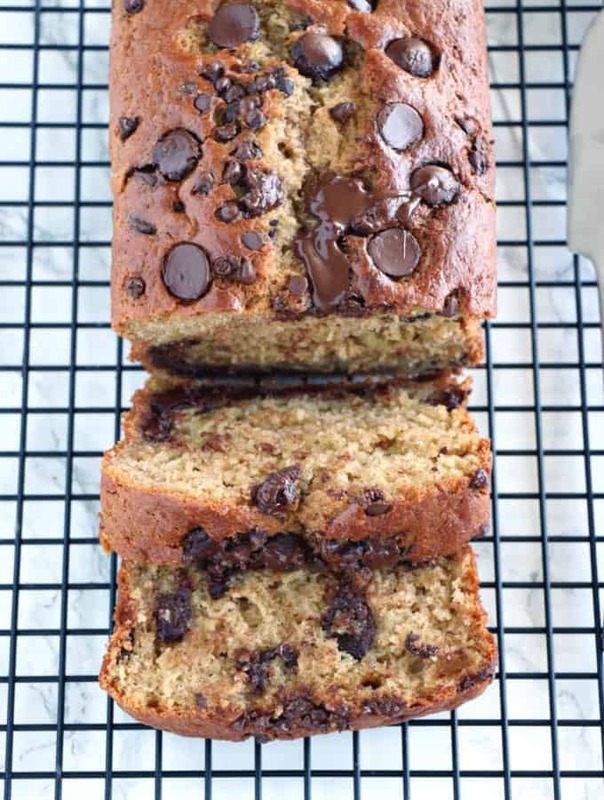 I am completely obsessed with my Chocolate Chip Zucchini Bread which is probably one of my most beautiful recipes on the blog by the way (simple but they look so real you think you can grab a slice directly through the screen. Just so you know: it doesn’t work!). I love how zucchinis make the cake so moist – and no, it doesn’t taste like veggies. In this recipe, I combined both zucchinis and carrots that together bring all the moistness to the cake. I measured in cups and grams to make it as precise as possible, but if you want to keep it simple, let’s say that 3 small-medium carrots and 1 small-medium zucchini, all finely grated, would do the job. You add all your veggies to a simple cake batter, that has become slightly sophisticated thanks to the brown butter. I explain the technique in detail in my recipe, and if you read carefully, you will see there is absolutely nothing difficult. You don’t even need to use a thermometer, just stop cooking when the butter turns slightly brown and releases a lovely nutty flavor (not burnt!). I then topped this zucchini carrot cake with a generous creamy frosting, again made in a small quantity, just enough to cover the top part of the cake loaf. I kept it as simple as possible, adding no vanilla or any other flavor, as the cake is already perfumed with spices. However, I topped with pistachios as I love both their flavor and crunchiness. You can replace with chopped walnuts and pecans if you wish. I hope you enjoy the recipe! Preheat the oven to 350°F (180°C). Grease and flour a 9×5-inch (23×13 cm) loaf pan and set aside. For the brown better, melt butter in a saucepan over medium heat. Butter will begin to foam and crackle as it melts. When the crackling subsides, the butter will begin to brown. Swirl the pan as the butter cooks. When the butter browns and begins to smell nutty, remove the pan from the heat and transfer the butter to a small bowl in order to prevent the butter from overcooking and burning. Set aside. In a medium bowl, whisk together eggs, vanilla extract, and homemade buttermilk*. Stir in the grated carrots and zucchini. Whisk in the slightly cooled browned butter. Add the wet ingredients to the dry ingredients and mix until combined. Add the chopped walnuts and gently stir. Pour the batter into the prepared loaf pan and bake for 45 to 50 minutes, or until a skewer inserted into the center of the loaf comes out clean. Remove from the oven and allow to rest in the pan for about 10 minutes, and transfer to a wire rack to cool completely. In a medium bowl stir together cream cheese and butter. Add powdered sugar and salt. Whisk in 2 Tablespoons of cream, adding more if necessary. The frosting should be thick and spreadable. Spread the frosting over the cooled loaf cake, and sprinkle with chopped pistachios. * To make homemade buttermilk, pour one tablespoon of fresh lemon juice in a measuring cup and cover with milk until you reach 1/4 cup (60 ml). Let sit for 5 minutes before using. Oh merci beaucoup Marie pour ce petit mot adorable 🙂 Très bon week-end à toi également! POurquoi choisir entre carottes et courgettes quand on peut avoir les deux ? Ce zucchini-carrot cake me donne l’eau à la bouche ! Comme toi j’adore cuisiner mais parfois je fais simple car je n’ai pas envie d’y passer des heures. Il me tarde de voir ta version aussi! This looks so decadent and delicious! I can’t wait to try it! I’m new to your page and I’m delighted with all the wonderful recipes I’m finding to try! I have a question on this one, it calls for “1 tbsp. coffee baking soda” Is this a typo or is there a coffee flavoured baking soda out there I need to track down? Hi! Oh, there is a mistake in the recipe, it’s one teaspoon baking soda (the mistake comes from the translation from the French version 1 teaspoon = 1 cuillère à café). I will change it in the recipe too. Sorry about that!